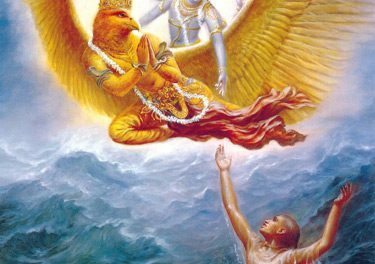 Lord Vishnu said, “My dear Lakshmi, now I will describe the glories of the Fourth Chapter of the Srimad Bhagavad-gita. On the bank of the river Ganges there is a town of the name Kasi, (Banaras), where at the temple of Vishvanath, a great saint of the name Bharata lived. 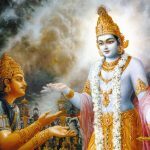 Daily with the greatest devotion, he would recite the fourth Chapter of Srimad Bhagavad-gita. 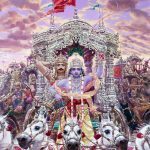 Previously, when Bharat had been traveling on pilgrimage he had gone to the town of Tapodan to take darshan of the Deity of Lord Krishna there. While leaving that town, he saw two Bael fruit trees. Deciding to take rest under the shade of those trees, he lay down, using the root of one of the tree as a pillow, and a root of the other to rest his feet upon. After some time, when Bharat left from that place, those two trees started to dry up. Within five or six days both trees completely dried up and died. 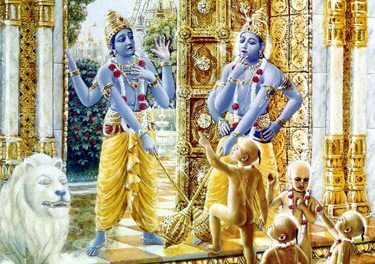 The two souls, who had been living in those trees, took their next birth as the daughters of a very pious Brahmana. Once, when those girls had reached the age of seven years, they had gone on pilgrimage to Kasi (Banaras). While wandering in Kasi, they happened to see the great sage Bharata. 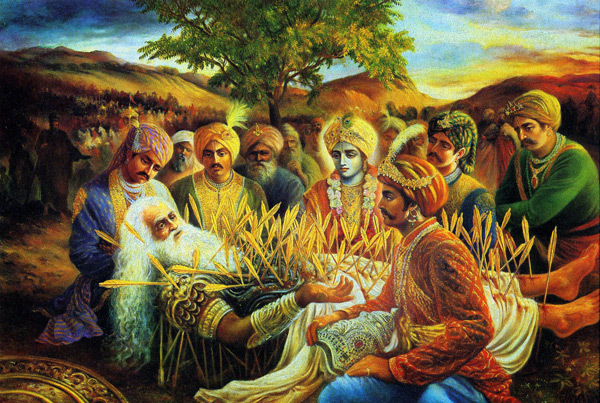 When they saw Bharata Maharaja they immediately went and fell at his feet and in sweet words said, “Oh. 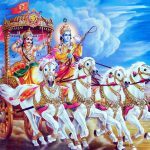 Maharaja Bharat, due to your mercy we both became freed from the tree form of life.” When Bharata Maharaja heard their statement, he became surprised. He inquired from them, “My dear daughters, where and when did I come in contact with you, and free you from the form of trees? Also kindly inform me, how you attained the form of trees? 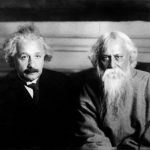 Because I do not know anything of this matter.” Thereafter, those two girls first informed Bharata Maharaja the reason for their attaining the form of trees. After receiving Lord Indra’s instructions, we left from his presence and went to the bank of the Godavari River, where Sachatapa was performing austerities. At that place, we both started to sing and dance very provocatively close to Sachatapa, with the intention of causing that sage to engage in a sexual relationship with us. While dancing, our covering cloth slipped down and our breasts became visible. At that time, taking water in his hand, that sage cursed us in the following words. “You both go and become Bael trees on the bank of the river Ganga.” upon hearing his curse, we both fell at his feet and begged his forgiveness. 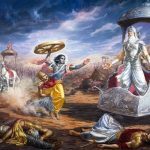 “My dear sage, please forgive us, for we are simply the servants of Lord Indra.” Seeing our submissive attitude that sage became pleased and informed us that we would remain as trees until Maharaja Bharata came in contact with us. And he also blessed us, that we would be able to, remember our previous births. Do you have a question? Please write.